Anacamptis morio got its name from the Greek word “moros” meaning “duncecap” – a reference to the carnevalistic impression of the green stripes in the upper parts of the flower. The plant is slender and with 10 to 30 cm rather short. The foliage leaves – lanceolate, green and unspotted – form a rosette at base. Further up they embrace the stem neatly. The inflorescence is short and numbers about 5 to 20 flowers with upward directed spurs. The two petals are shorter than the sepals. Together they form a loose hood. The labellum is fairly wide and weakly three-lobed. The two lateral lobes are often strongly directed downwards but sometimes positioned in the same horizontal level as the middle lobe which shows a variety of small dark spots. The two pollinia are attached to a commun sticky plate, the viscidium. 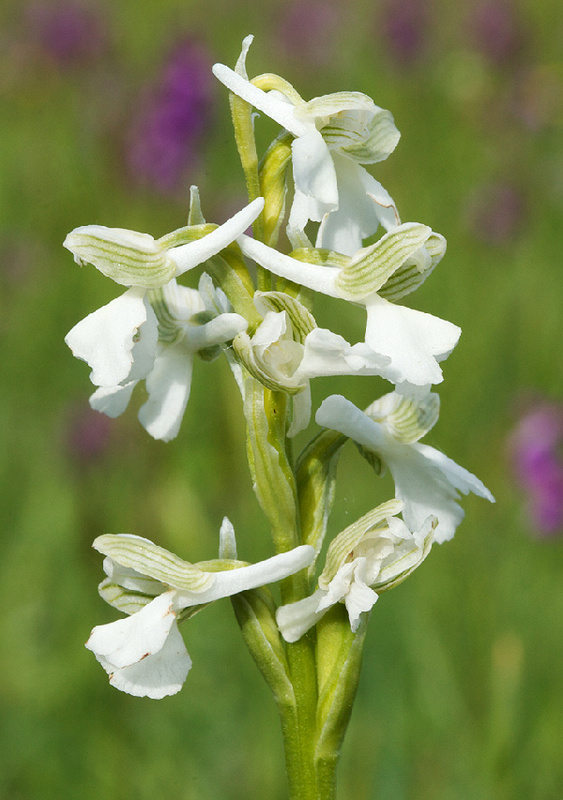 In 1753, Linné registered the plant as Orchis morio. That’s still the name accepted by most botanists and in most decriptions until today. 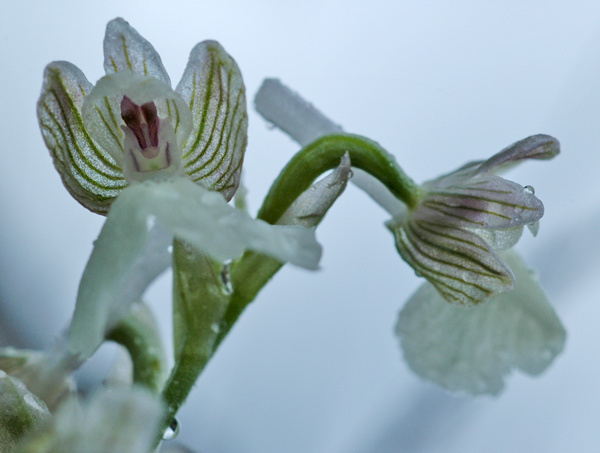 Due to genetic studies and a new view, Richard M. Bateman and others put the plant to the genus Anacamptis. H. Kretzschmar, W. Eccarius and H. Dietrich (Die Orchideengattungen Anacamptis, Orchis, Neotinea. 2007) further devoloped this line of argumentation: They are pointing to the non-divided middle lob of the three-lobed labellum and the two prominent ridges at the entrance of the spur. Kretzschmar et al. view Anacamptis morio as belonging to one of seven sections of the genus, the Moriones. This section is monospecifique with only the one species Anacamptis morio and six subspecies: morio, caucasica, champagneuxii, longicornu, picta and syriaca. The flowers of Anacamptis morio show a great variability in form and colour. The main colour ranges from pink to a deep violet. 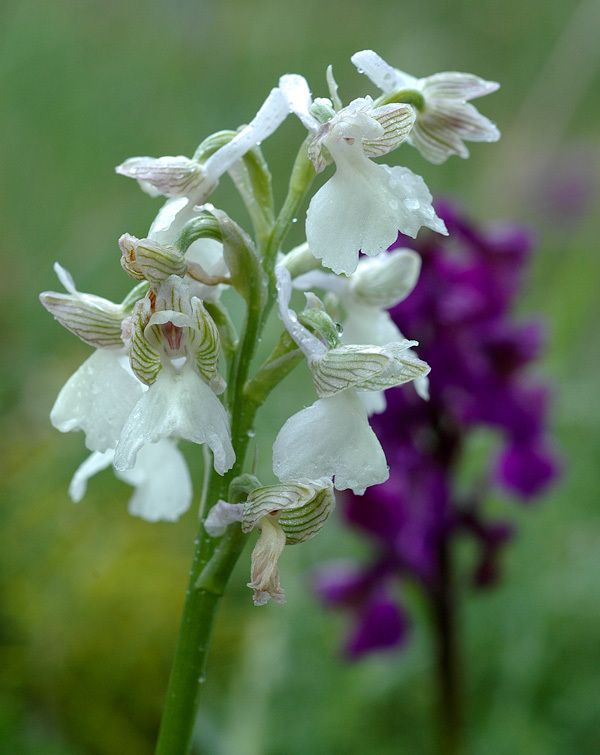 But of all the orchid species Anacamptis morio probably has the greatest tendency to develop white flowers. 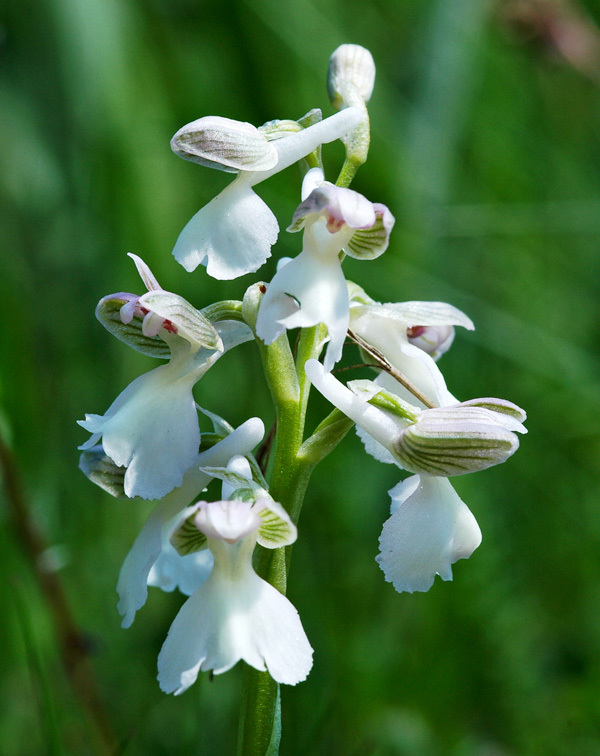 Strolling through the mountain plaine of the Gargano region in Apuglia, Italy, we’ve found three plants with white flowers in one afternoon alone – out of an abundance of about one thousand Anacamptis morio with flowers in the standard colours. In the 60s of the 20th century, the Danesch couple noted for this region: “In some areas of Apuglia we’ve observed especially numerous plants with very bright or pure white flowers. In specific populations the white flowers are even in majority.” (Danesch, Edeltraud/Danesch, Othmar: Orchideen Europas – Südeuropa. Bern/Stuttgart 1969. S. 162). And Helmut Presser noted in his “Orchideen. Die Orchideen Mitteleuropas und der Alpen” (2. Auflage, 2000) that the white form of Anacamptis morio “is not very rare and can be found quite often in some places of Southern Europe”. I estimate the frequency of morio albiflora forms with a ratio of about 3 to 5/1000. Anacamptis morio lives on dry grassland, meadows and pastures on calcareous soils, but also on wet meadows and in marshes. Bloom is from March to June – depending on the altitude which can reach up to 1950 m. Distribution is wide spread and reaches from Ireland, Southern England, Southern Sweden and the Baltic countries to Portugal, Spain, Italy and Bulgaria.